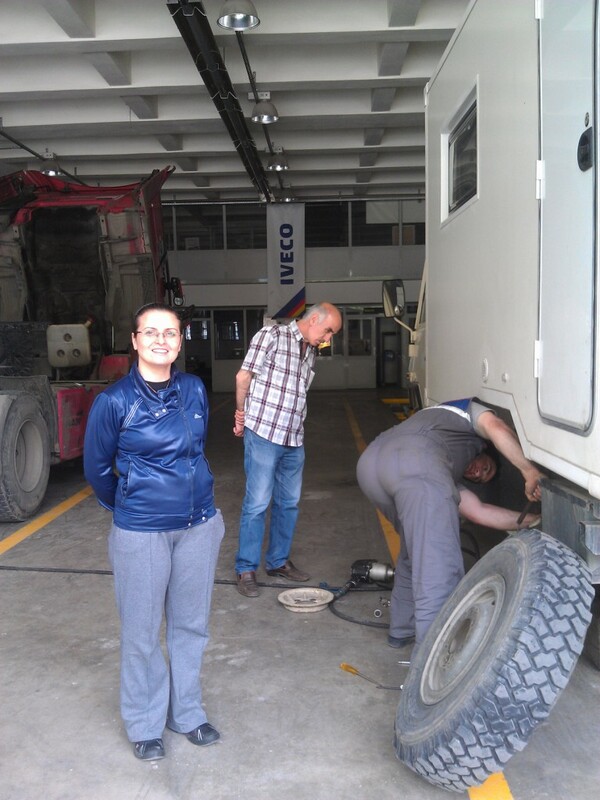 Still no Iveco parts when we stopped in at the hotel, still no more useful information online – but the parts were at least in Turkey. We made it Trabzon early that day, and decided to check out the city. It was a struggle negotiating the busy streets without knowing where we were going, but a kind man took pity on us and lead us straight a parking place that could accommodate our 3 meter high truck right in the city centre. Perfect. We were there to find some US dollars from a branch of our bank, try to call about the package to find out where it was and to get some tourist info. We succeeded in one of those things – tourist info. Most of the day was spent trying to do the other 2 things on our list. The bank wasn’t too helpful, but that is probably also our fault for not being able to speak Turkish to them. Being Friday also meant that it was our last chance before they were closed for the weekend. The phone call also took some time because we needed to get a local SIM card and then have it work in order for us to make the call – this took about 2 hours. Luckily we were able to spend our time enjoying a nice lunch in the main square, followed by some ice cream at a café nearby and had a nice stroll through the old town and bazaar. The tourist office recommended camping up near the view point of the city, which sounded like a great idea. So after all the errands were done (or the shops closed) we drove up and up and up to the viewpoint. Unfortunately, it seemed like there were a lot of other people with the same idea and those steep tiny roads were teeming with other vehicles. It was a little too stressful and we didn’t really see anywhere to camp, so instead we descended the other side of the hill through some equally steep and narrow streets which were slightly less busy and decided to head towards a monastery that we planned to visit the next day anyway to settle own for the night. We had a slow start in the morning and woke to a stream of tourist buses bringing Turks to come and see the ancient Sumela monastery built high up in the cliff walls. The steep winding path up was near endless, and the views down the valley well worth the effort on the rare occasions where the clouds moved out of the way. The Monastery itself was a little disappointing – totally crammed full of people and largely reconstructed, though some of the original buildings were still intact and it was possible to get some sense of what it must have been like to live there all that time ago. We decided that it was time to have someone look at the brakes, which were now howling like banshees. We stopped in at a garage, but the drive down the mountain had heated the drums up so the screech was now at a tolerable level – so the guy took a quick look, told us everything was fine and we were sent on our way. Nearly everyone that we had met from the area had told us that there were several ‘must see’ attractions. The Sumela monastery and Lake Uzungol were always at the top of the list. With this in mind we made for the lake thinking it would be a good spot to sleep and a nice area to spend the following day. After finding a deserted car park right on the lake side we rested up for the night. There was a reason for that large car park right on the lake side; it was so that in the morning it could fill up with people. We had managed to park smack bang in the middle of yet another tourist hot spot. It is not possible to know exactly how many people’s photos of the area were ruined that morning by a large white camper van appearing in a prime location on the shoreline, but it would not be a surprise if it was in the hundreds. In just getting out of the truck to open a tap to change water tanks over, Vaughan was asked to pose for photos with a group of young guys stunned to see a European there, and keen to practice their English. Having now visited the two best known landmarks in the area we can confirm why the region does not feature heavily in English guide books to Turkey. The lake was also nothing to write home about, and barely anything to blog about. Just a lake, but lined for the most part with neon hotels and shops keen to unload their Uzungol branded tat (stuff) on the unsuspecting passerby. The views were okay, but nothing compared to those of the mountainous area that we had driven through on the way. We headed off pretty early in the day, in the hope of finding “Packet: Yes” back in town. Still no sign, so we went into the shopping mall in search of food and a dose of Wifi so that we could check up on these elusive parts. 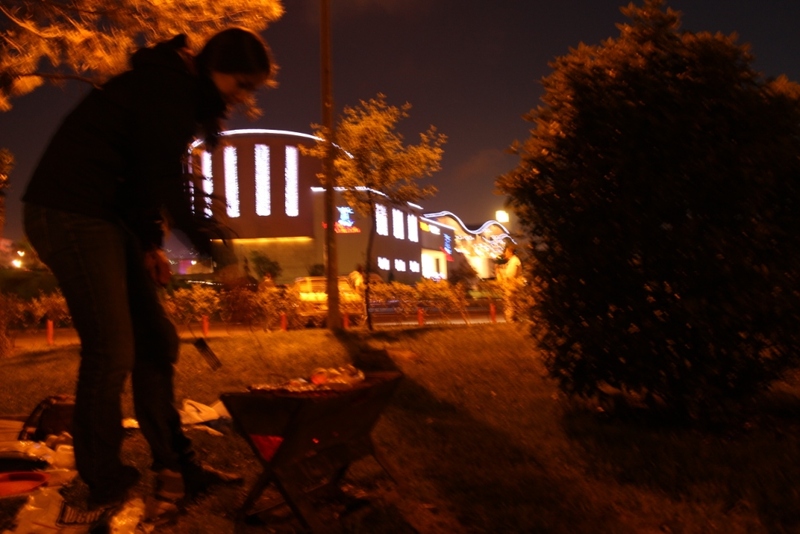 That night we had a barbeque in a park in town, and slept in the car park. One of the park workers spoke very good English, and wanted to find out what the GB plated car was doing there. It turned out that he’d owned a shop in Taunton, England for several years. He assured us that it was fine for us to camp up, and on hearing of our planned route warned us to be careful when crossing Azerbaijan, since he had also been a truck driver for a time and had found the people there to be difficult, and keen on petty theft – He spoke highly of the people in the stans that we would cross after the Caspian sea though, and said we should have no trouble at all with the rest of our route to China – Comforting to hear from someone who had regularly travelled the same route that we were about to undertake. The brakes were still being very vocal, particularly when cold, so we went back to the friendly mechanic we had stopped in at two days previously. We were spared the miming game since the man remembered us and this time Ivor was singing loudly as we came to a stop, so the problem was obvious. The road was being worked on outside the garage, and all the workers wanted to know what we were up to – so immediately tea was sent for and we were entertained for a good hour or so before the brakes could be looked at –some more warnings were given about Azerbaijan, so we would be watching our backs for sure. The mechanic took off the drums and again found no obvious problems, but found that by abrading the shoes and the inside of the drum with sand paper the noise was greatly reduced. He only asked for 30 Turkish Lira for the hour of work (about 15 USD) so we gave him 50, since it was the second time we had been back to him – and he was beaming. 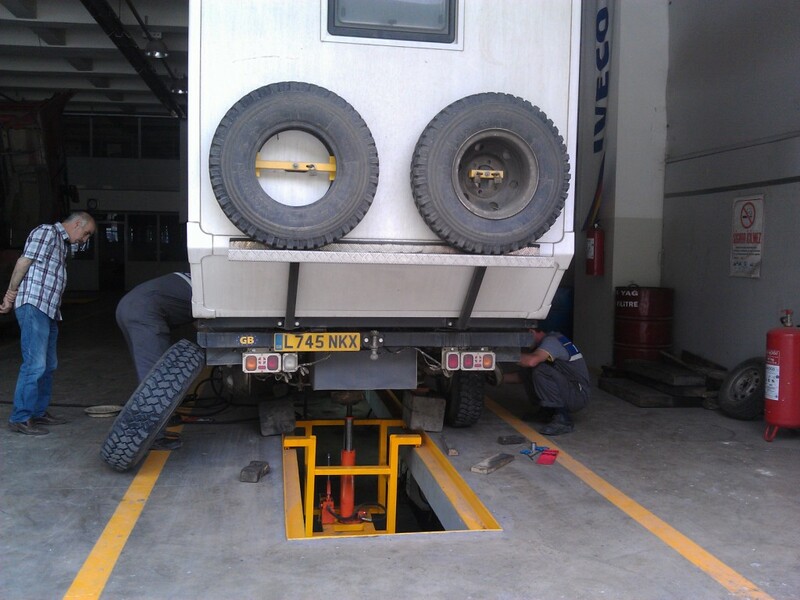 This was the first time after the 4 trips to mechanics on the trip so far that anyone had accepted any money! With near silent brakes we continued our tour of garages and stopped in at an Iveco one we had spotted to get some replacements bolts for the ones that had rounded off before. Everyone there was incredibly friendly and very happy to help. It was a family firm, and we were introduced to Eda, one of the girls who worked as an accountant and spoke very good English. Tea was again in our hands before we knew it and the bolts were fitted free of charge, and Ivor was even given a wash before photos were taken from both sides, and we were sent on our way. While we were there Eda had been kind enough to call the Turkish postal service on our behalf, and had found out that our parts were still stuck in customs at Istanbul and were unlikely to make it to Trabzon for another week – so much for a 5 day delivery service! We decided that to wait for the parts to arrive we would be cutting it too close for us to still make it to the Chinese border for the 20th of June, and Ivor had not been leaking much more oil, so we would camp up at the park one more time and make our way towards Baku in Azerbaijan in the morning – In the hope of reuniting with Kim with her Canadian passport (now containing a Chinese Visa), and making our crossing of the Caspian sea to get back on track.